Web developer for small business since 2002. All-In-One Website Development and more. Effortless website and marketing solutions bundled only as you want them. From target specific landing pages, to large multi-page and complex websites, WebPro360 has you covered. WebPro360 builds eCommerce sites from simple landing pages to full online catalogs. A large budget is not required to launch your online store. WebPro360 develops mobile apps, from building to hosting and maintaining. We're proud of our ability to offer full scale solutions for a variety of services. Whether it's a brand new logo, or just a logo update we can help design you something you will love. If your website was last updated in 2015, it's probably time for an update. We offer a variety of update options from basic edits to complete redesigns. WebPro360 develops and maintains effective online marketing campaigns so you can focus on your customers and running your business. WebPro360 offers a variety of effective SEO plans to support your site and maximize your budget for the best return on investment. We offer a wide variety of hosting plans from basic wordpress and high volume eCommerce to app hosting and maintenance. Build a Plan Around Your Budget and Needs. We will build you a customizable package not only to fit your current budget, but that can grow and adapt with your business. As your technology continues to advance a strong online presence becomes more and more important. WebPro360 is dedicated to helping you build your online presence. 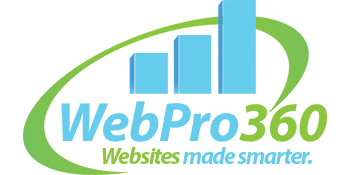 Call (800) 360-9882 and see how a smarter website can transform your business. Sign Up! Strategies to grow your business delivered to your Inbox. Thank you, watch email to confirm your free subscription.